All Weather Tubes for Rear Sights – Various lengths. Trigger Guards for RPA Quadlock and Quadlite, Swing and Paramount. 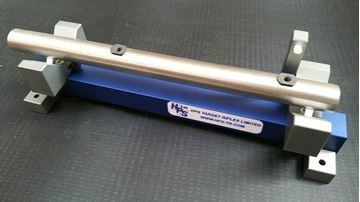 Rod Cleaning Guides for RPA Quadlock and Quadlite, Swing, Paramount, Barnard P and S actions. Spirit Levels - Available integrally in 22mm and 32mm diameter tunnels or as front or top mounting for 18mm and 22mm diameter tunnels. Telescopic Sight Mounting Rails to fit Picatinny/Weaver rings for RPA Quadlock and Quadlite, Swing, Paramount, Barnard and other round actions. Anschutz Forend Rails for wooden or composite stocks. Eyepiece Adaptors for Rear Sights - Various male/female/size combinations. RPA Firing Pins and Spring conversion kits, Cocking Pins, Swing and Barnard Extractors. Swing and Paramount Firing Pins and Springs. And all other RPA and Barnard parts.